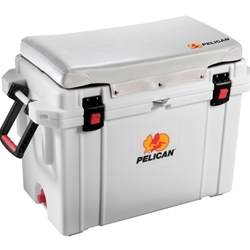 Pelican ProGear Elite Cooler 65 & 95 Quart Seat Cushion is designed to be installed to the lid of your 65 & 95 Quart Elite Cooler and allow for additional seating when you are out with your cooler. The cushion comes with the hardware to install it to the lid of your cooler and is only available in white. Shipping Dimensions39.00" x 22.00" x 6.00"